Syria Solidarity UK: How can ‘Stop the War’ help stop the war in Syria? How can ‘Stop the War’ help stop the war in Syria? A personal reflection on engaging with Stop the War, by Hala Alshami. I was delighted to accept an invitation to attend a public meeting in December organised by Waltham Forest Stop the War and Stand Up to Racism, and an invitation to speak at a Stoke on Trent protest organised by Staffordshire Stop the War. I am anti-war myself and I believe in engaging with people. I wanted to speak to the conscience of the Stop the War members and try to convey the voices of victims of the war in Syria. I met many wonderful people, and I was touched by their compassion and eagerness to campaign against wars. I have so much respect for Stop the War’s protests against the Iraq invasion in 2003. I highly appreciate their recent campaign to welcome refugees. I also have so much disappointment and disagreement regarding Stop the War’s position on Syria. I am aware that many members of Stop the War are perceiving the Syria war through the same lense as they saw the Iraq invasion in 2003, as ‘an unjust imperial war.’ This is one of the main reasons for the big clash between Stop the War and people supporting the Syrians’ struggle for freedom, dignity, and democracy. I will present my perspective about the Syrian revolution, which might be different to their perspective; it is always helpful to see the other side of the story. Acknowledging our differences can help us to find a common ground and to work together for a just cause. The Syria war is tragic and I am writing to the minds and hearts of peace-loving people to reflect, and to suggest things we can do to help. Let me start by sharing a personal story about my nephew, a twelve year old Syrian boy who came to the UK for a summer school. During our London tour, we passed by a demonstration at 10 Downing Street and he asked what was going on. I briefly explained to him that people come to the Prime Minister’s office to protest or demand something. “And does the government listen?” he curiously asked. “Sometimes!” I smiled. We could all be cynical about Cameron’s government! My nephew again curiously asked whether everybody is allowed to come here to protest. I nodded, then said, “but they need to let the police know in advance. “From what?” was his next question. “To protect the people who are gathered, in case there is a problem or a fight,” I replied. Can you imagine the police in UK shooting live ammunition on peaceful protesters? Can you imagine the police then firing live ammunition against people attending the funerals of the victims, and killing more people? Can you imagine the police detaining, torturing or exiling the rest of the opposition? Can you even imagine the UK government using chemical weapons and barrel bombs against their own people? Anybody discussing Syria must keep these scenes in mind. 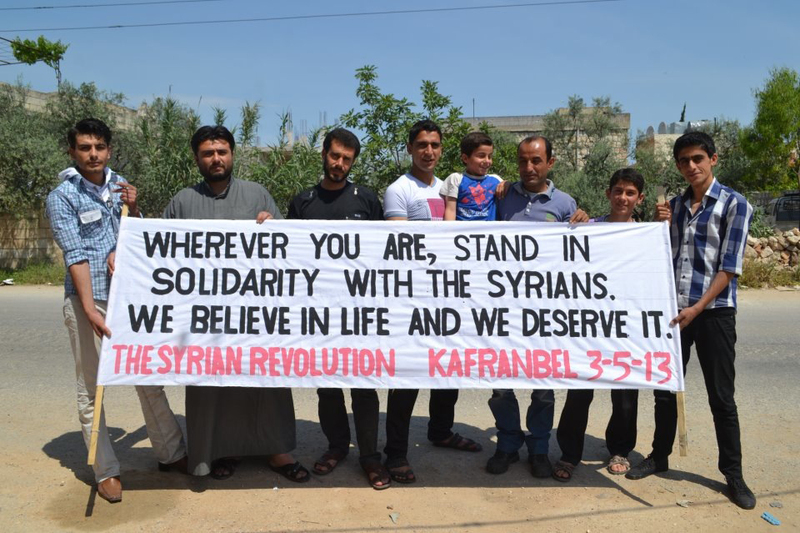 As the whole world witnessed, the Syrian peaceful revolution started in 2011 when people took to the street demanding freedom, democracy, dignity and human rights. Assad did not listen to the legitimate demands of the people; instead, the regime, supported by Iran and Russia, used all kinds of weapons to kill them. The revolution was peaceful, but then people needed to defend themselves against the regime’s brutality and it sadly turned into an armed conflict. Even Palestinian refugees in Syria were not protected against Assad’s atrocities, and Palestinians in the Yarmouk refugee camp were besieged, starved and terrified. In August 2013, chemical attacks were launched in Ghouta, a Damascus suburb. Today, Syrian civilians still come under chemical attack. Many countries got involved and started fighting their proxy wars in Syria. ISIS found a fertile ground to grow in the mess and more countries started bombing Syria claiming to defeat ISIS. Even Israel and Russia are now coordinating their military attacks on Syria. The question that must be addressed here is how is it morally and ethically acceptable to leave Syrians alone to face the brutal regime, and several proxy wars? What about civilian protection? In her recent article responding to criticism of the Stop the War leadership, Lindsey German writes, “The task of any anti-war movement is to oppose its own government. The question of what happens in Syria is for the Syrian people to decide.” Well, anybody with minimal knowledge of the situation in Syria and the multiple proxy wars fought in Syria would understand that sadly it is not Syrians who are deciding. The biggest irony is Lindsey German wrote that article as part of political battles among UK political parties over Syria. I am really thankful to Father Steven Saxby and Dylan Connolly for inviting me to Stop the War events. It shows solidarity and willingness to listen to Syrians. There have been numerous unsuccessful attempts by Syrian activities to engage with STW and to speak at STW events. Some Syrians were even asked to leave a protest against bombing Syria. It is worth mentioning that there were two times when the Stop the War leadership invited two Syrian speakers who fit their twisted narrative. They invited the infamous Mother Agnes Mariam who went on an international speaking tour denying the chemical attacks on Syrian civilians. Father Paolo Dall’Oglio, who lived in Syria for 30 years and was exiled by Assad and then abducted by ISIS, described Mother Agnes Mariam as “an instrument” of Assad’s regime. “She has been consistent in assuming and spreading the lies of the regime, and promoting it through the power of her religious persona,” as he was quoted by The Irish Times. “She knows how to cover up the brutality of the regime.” Journalists Jeremy Scahill and Owen Jones refused to participate in that Stop The War conference unless Mother Agnes was dropped from the schedule. Eventually, she pulled out. How could a sane person state that over 350,000 people were killed and not asked who killed them, and not ask how can we stop more people being killed? He raised the question “who is behind ISIS,” which might sound a reasonable question by itself, but in this context, it reveals an abhorrent manipulation in the name of God, Allah, Buddha, and Brahma. 350,000 Syrians killed and the only question he asked is “who is behind ISIS” with no mention of Assad whose forces have killed most Syrians, without even speaking about civilian protection. Is it because the Stop the War leadership is truly an agent for Assad, or is it because Assad is killing Syrians while ISIS is killing both Syrians and Westerners? Don’t all lives matter? 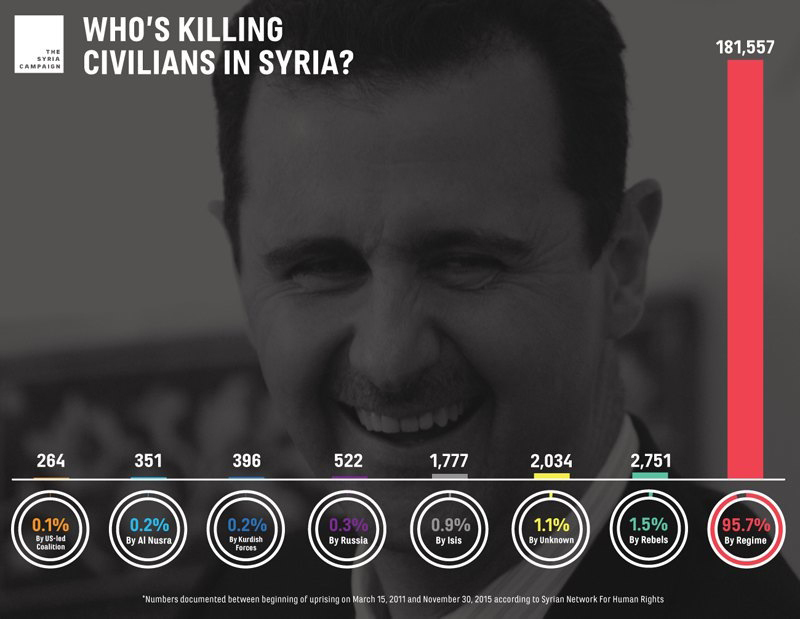 According to human rights groups, the vast majority of Syrian civilians killed—more than 95%—have been killed by the Assad regime. As a person of faith myself, it makes me so angry that Stop the War leaders use religious figures to fit their agendas in compliance with the Assad’s crimes. It hurts me in the same way that ISIS abuses my religion to commit atrocity. Rather than giving the victims of the deadly war a chance to speak in their so-called peace protests, Stop the War’s leadership rejects any criticism of Assad. They shamelessly refer to the moderate revolutionary Syrians as “jihadists,” ignoring that Syrians did not want a violent revolution. They repeatedly invite non-Syrian speakers who openly excuse or support Assad such as Tariq Ali and George Galloway. I call upon all members of the Stop the War Coalition to ask the group’s leaders why they are doing this, and to start searching for the truth for themselves. There are many ways to show solidarity with Syria. 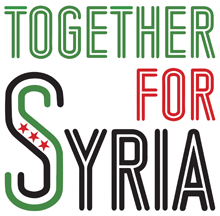 You can join Syria Solidarity UK, “a network of activists, academics, trade unionists, socialists, lawyers, doctors, nurses, students committed to solidarity with the Syrian Revolution.” This group is also part of a of civil society network inside and outside Syria. The media does not usually cover this positive side of Syria. I highly encourage you all to check out the civil society groups such as Rethink Rebuild, the White Helmets, the Syria Campaign and Planet Syria. Read about the Syrian local councils in the areas liberated from both the regime and ISIS. Syrians are trying to form local governing councils through elections, and trying to construct a new democratic society. These local councils and civil society groups and organisations are the hope for Syria. 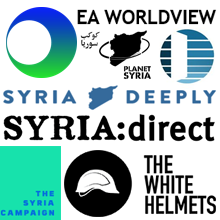 Follow their web pages and show them your support and solidarity against Assad and all the foreign interventions by Russia and Iran, US, UK and all. 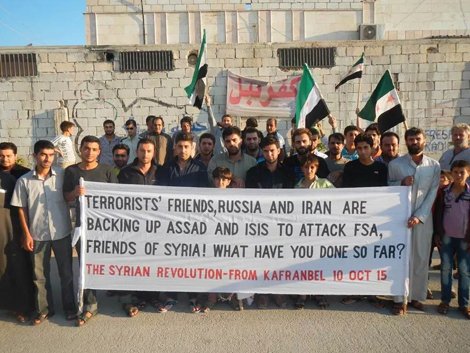 The lack of solidarity with Syria from the entire world and especially among some peace activists is shocking. Many Syrians feel the world has abandoned them given the extremely high death toll and the large scale of destruction of the country. For almost five years Syrians have suffered, and we all want an effective and ethical political solution to the conflict. The United Nations Security Council issued Resolution 2254 outlining a peace process in Syria, with confidence-building measures including a halt to the use of barrel bombs and other indiscriminate weapons against civilians, as well as granting unconditional access to aid convoys, lifting restrictions on the delivery of medical aid and releasing all detainees. However, even after this resolution, Assad and Russia continued daily bombings of civilian areas. On 25 December, the leader of Jaysh al-Islam Zahran Alloush was killed in a Russian air strike in the suburb of Damascus. Alloush was an influential rebel leader on the ground. He was willing to work toward a political settlement and he had participated in a conference in Riyadh in preparation for UN-backed peace talks. His death is considered as a blow for the peace talks. It shattered any illusion of trust building. Assad and Russia continue their atrocities, ignoring the UNSC resolution and the joint declaration by the governments of France, Germany, Qatar, Saudi Arabia, Turkey, UK, and US, expressing deep concerns with regard to military actions of the Russian Federation in Syria. All politicians and activists have to understand that a political solution can only be reach through a real threat of military means and through real pressure on Assad’s supporters. We all must recognise the deadly consequences of the failure of the international community to act. Another big irony of Stop the War and other anti-war organisations is that they keep praising themselves for the ‘victory’ of the tragic UK parliamentary vote in 2013 against military action. It was only a victory for the tyranny of Assad. The regime took it as being given license by the international community for his crimes against Syrians. For example, with a group of my Syrian friends we went on the 1st of December to protest in front of the Parliament against air strikes on Syria. The protest was organised by Stop the War. Richard Burgon MP was speaking and he was wondering if they could be forgiven for “being sceptical” about Cameron’s recommendations, the same prime minister who just a few years ago was recommending to the parliament to bomb Assad. He then stated, “And bombing Assad would have assisted ISIL. It would have assisted the terrorists.” I shouted “NOOO” for this statement. Bombing Assad would have deterred him from killing his own people. At that time, about 100,000 people had been killed by Assad, and ISIS were just beginning to come from Iraq, attacking FSA rebels. Because nobody stopped Assad, as the UK parliament voted no and the US then decided against, now over 350,000 people have been killed, we have the largest refugee crisis since World War Two, and we have ISIS across Syria and Iraq! This might be a hypothetical argument, as the Parliament did not approve Cameron’s proposal to bomb Assad. However, the urgent questions for all activists, politicians and MPs who were against bombing Assad in 2013 is what have they done to protect the Syrian civilians since then? Are they willing to admit that because Assad was not deterred, now more the 350,000 people have been killed? And what are they doing now? What are they going to do to protect civilians from the atrocities of Assad and his supporters? Stop the War can help stop the war in Syria by real condemnations of Assad’s and Russia’s war crimes in Syria. Stop the War have to condemn Assad’s and Russia’s aggression with the same force that it condemns US aggression in places like Iraq and Afghanistan. Will they join us in protests in front of the Russian embassy? Stop the War leaders usually speak on the Russia’s RT television. In their interviews, will they condemn Russian military actions targeting schools, hospitals, markets and rebels sites in Syria? Within three months, Russian airstrikes killed over 800 civilians in Syria, according to the Syrian Network for Human Rights. The Violations Documentation Centre in Syria counted over 1,100 civilians killed by Russian air attacks. Amnesty International reported on Russia’s shameful failure to acknowledge civilian killings. Stop the War can help stop the war in Syria by standing in solidarity with the victims of the many wars fought in Syria. They can demand political leaders stop using Syria to fight their own political battles, and demand a clear and detailed plan of what they will do to protect civilians. They have to stop wishfully talking about a magical peaceful solution while Syrians are dying. Jeremy Corbyn said the he sees “use of force and threat of force as absolute last resort.” I wonder how many more Syrians lives should be lost, beyond 350,000, for Corbyn to admit that the threat of force has been long overdue. I invite all people to answer in their conscience, how is it ethically and morally acceptable to see innocent Syrian civilians being slaughtered and do nothing about it? The UK and the international community possess the political and military means to stop this almost five year massacre of Syrian civilians, and they have not used them effectively yet. The world’s inaction leads to more death and distraction every day. Let’s all stand in solidarity with Syrians. We all want the war to end. Syrians will rebuild a new Syria with freedom and democracy. I still have faith in humanity. The Syrian revolution has shown the true meaning of strength, determination, and hope, seen for example in the Syrian Palestinian Yarmouk Band who were playing music and singing in the streets amidst the rubble of Assad’s bombs. We believe in life and we deserve it! Congratulations! A very powerful, important article. I will tweet. Solidarity! Free Syria! This is really a commentary in support of yet more war to be made on Syria by the US and its ME and European imperialist allies. Further, it is actually in support of NATO's war efforts in Libya and Ukraine, as it guns for blaming Russia for what the US and allies are causing. This is the fact. As I mentioned in the article the problem with STW is that by not admitting civilians are being killed and tortured, they are siding with the perpetrators of these crimes. Thank you "ardent1" for being a mass murder denier, and attempting to exonerate the war crimes of the Assad Regime. No informed person is going to swallow this ignorance now. The tag of "imperialism" applies to elites in US, Europe, Israel, Egypt and the ME monarchies. It equally applies to elites in Iran, Russia and China. The Assad Regime is a product of neo-colonialism via a military coup in 1970 supported by the Soviet Union. The only aspect you got right, is that the human rights record of the Assad Regime could be used in an imperialist war in Syria. It is also compelling genuinely progressive people in the West to demand that their governments support Syrians fighting for representative government. In the absurd hard left narrative these people do not exist. The reality that the West has given very limited support to the moderate armed opposition in Syria over the least 4 years is ignored. The Russian backed Syrian Army designed to challenge the huge Israeli war machine, can be fought with pamphlets apparently. The reasons why fighters give up or join groups that are given support is obvious. The commitment to ideology is secondary at best. If you want to talk in tags, then the leadership of the STWuk are supporting fascism, and skillfully misleading others into the same trap. If it is 95% then this is in probably because rebel terrorist like to use Hospitals and other civilian areas to launch their attacks from. Retaliation against the terrorist will result in civilian casualties. If they gain more ground they gain more innocents to hide behind. If they loose ground they claim that the Syrian Govt is the cause of the atrocities and then retreat to area's occupied by civilians ect, ect. The most telling point is that when the terrorist rebels arrived in Aleppo that half the population fled to other Syrian Govt held area's to escape the terrorist rebels. Which points to me that the Syrian people would prefer to live under the Govt rather than the head chopping NATO backed forces. Thank you "Lara Keller" for being a mass murder denier, and attempting to exonerate the war crimes of the USA Regime. Which has been involved in over 200 years of conflicts around the world which is on show for all to see if you have the internet. No informed person is going to swallow this ignorance now. Did you get feedback from the Stop The War members on your speeches? Clearly the STWuk leadership are hard line ex-SWP Trotskists motivated by politics rather than a deep believe in pacifism. They have hijacked the "progressive" pacifist mantle for their own purposes. However surely they have a willing pacifist audience that wants a source of information to protect their beliefs? Corbyn means by "last resort" that just like Palestine-Israel conflict, the Syrian peace talks can go on forever, never reaching the "last resort", while the stronger side carries on the destruction. Leveling personal abuse at ordinary SWTuk members is both impractical and incorrect. As your excellent article states the STWuk position on Syria is not "progressive" but the vast majority of STWuk members are decent people. We need a truly progressive anti-dictatorship movement, that uses the techniques developed by STWuk. That provides a vigorous attack on the status-quo of insulting the struggle of ordinary Syrians for representative government, glorifying inaction in the name of past self-seeking interventions by Western elites, and the defeatism that ordinary people cannot influence foreign policy in democracies. All people should be worried that inaction in response to the Arab Democratic Uprising by the West, is proof of the suspicion that our leaders are indifferent to the principle they should and claim to hold at their core, of the value of representative government. STWuk have also been successful in the past in reaching out to other organizations (unions, charities, environmental, anti-racist .... groups) to build a coalition, as they have been seen as a safe "progressive" bet. Even if it is hard for these groups to give unequivocal support to real meaningful Syrian Solidarity, it will stir up heated debates within those organizations. In short we need to support the struggle of the Syrian people, as much as they need our support. We just do not know it yet. It is very long overdue. Stopping Assad in Syria, Where are the millions of Muslims and Progressives demanding action?